Monarch butterflies are currently making their spring pilgrimage through Texas, laying the groundwork for the next generation by depositing eggs along the way. The butterflies are also bringing good news: After a precipitous decline over the last several years, their numbers appear to be up. Researchers who monitor the butterflies in their wintering habitat, the Monarch Butterfly Biosphere Reserve located in Mexico, have detected a 100-plus percent increase of monarchs in the reserve and in other newly-discovered colonies nearby. But the monarch’s future is not secure. Deforestation, climate change, and habitat loss continue to threaten the species. Monarchs are also picky eaters. Although adult butterflies will drink the nectar of many different flowers, monarch caterpillars will only eat milkweed, a perennial herb with a milky secretion, making milkweed the only place the butterflies will lay their eggs. 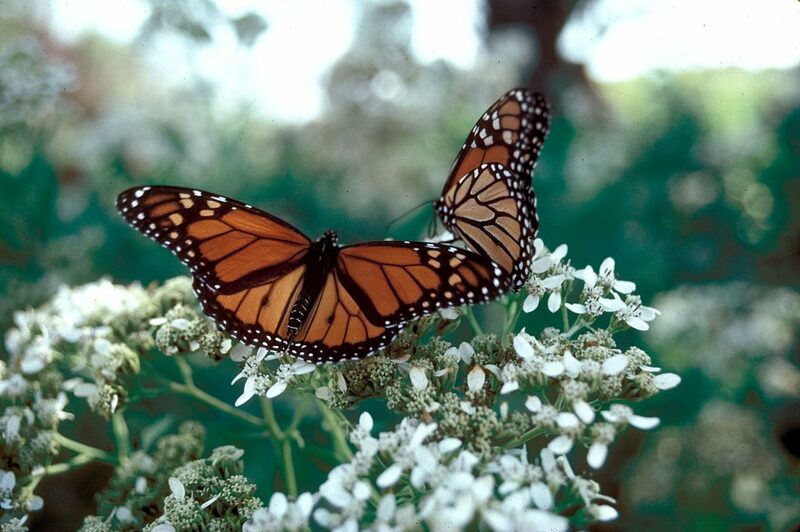 “Without sufficient milkweed plants, the monarch migration will be doomed regardless of other challenges,” explains Dr. Carl Wilson, a butterfly enthusiast and senior research scientist at Texas A&M University. Milkweed is still relatively common in Texas although many people consider it a noxious weed due to its toxic chemical compounds. But don’t worry: It doesn’t taste good so pets usually avoid it. Next time it crops up in your garden you might want to leave it for the butterflies. You can also purchase seeds from local garden shops and online if you want to help increase the monarchs’ chances. Monarchs make the trek across Texas and the rest of North America twice a year, part of a cycle of breeding and egg-laying to perpetuate the species. Adults spend winter months in Mexico then begin to cross into Texas by spring, laying eggs to create the season’s first generation of new butterflies. After maturing, the first generation adults fly northward and lay more eggs, creating generations two and three. These generations then breed and lay eggs as far north as Canada. As adults, this fourth generation makes the long return trip back to Mexico in the fall, often breeding and laying eggs along the way. Monarchs are patterned with black lines and white spots against a rich orange background, making them easy to spot. But they share these characteristics with two similarly-patterned, but smaller species—the viceroy and the queen. Once you know the differences, making a distinction is simple: 1) The viceroy has a solid black line across its hind wing. Monarchs have curved lines. 2) Unlike the monarch, the queen has no solid black lines on its fore-wing. Instead, it has a distinct pattern of white spots. To catch the monarch migration in action near you, visit the monarch tracking website www.journeynorth.org for weekly migration news, maps and daily updates.